Happy birthday Eleanor Schick (Navajo Wedding Day) and Jacqueline Briggs Martin (Snowflake Bentley). On this day in 1802, poet William Wordsworth and his sister Dorothy see a “long belt” of daffodils, which inspires “I Wandered Lonely as a Cloud.” Read Poetry for Young People: William Wordsworth edited by Dr. Alan Liu, illustrated by James Muir, and Daffodil by Emily Jenkins, illustrated by Tomek Bogacki. In 1912, 100 years ago, after hitting an iceberg in the Atlantic Oceon, the steamship Titanic sinks. Hence, it is Titanic Remembrance Day. Read Titanic: Voices from the Disaster by Deborah Hopkinson. This week we have been celebrating National Library Week. All kinds of libraries—school, public, and academic—participate in this annual event that celebrates the contributions of our nation’s libraries. If you haven’t registered a child for a library card recently, you will be pleasantly surprised about the offerings in children’s rooms of modern public libraries. Videos, audio books, recordings, and computers can be located in both schools and public libraries. Story hours and reading clubs help both parents and children find new books that they will enjoy. 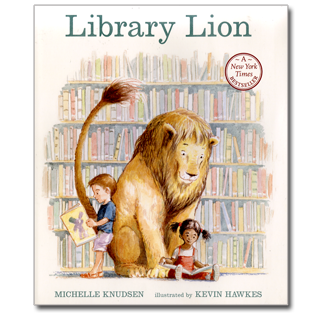 But my book of the day, Library Lion by Michelle Knudsen, resurrects the old-fashioned library of the 1950s and 1960s. Here the librarian Miss Merriweather worries about rules being broken. When a lion saunters into the library, she realizes, however, that no rules exist about them. As long as he remains quiet and does not roar, he can listen to story hour with the children. Then he learns to dust the shelf with his tail, lick envelopes, and serves as a footstool for children. All goes well until Miss Merriweather has an accident—and the lion must roar to get help. This old-fashioned story has been accompanied by acrylic and pencil illustrations of Kevin Hawkes. Hawkes is one of the most versatile illustrators working in children’s books today. He adapts his style for each new book, shaping his art to the demands of the text. The lion he renders is so charming that anyone would want to curl up with this furry friend. The pacing and timing of the pictures are impeccable. Printed on a creamy, off-white paper, the art and text draw readers in, pulling them along with the tension of the story. Since this book appeared in 2006, many families have decided that Library Lion is one of their favorite books, one that they buy and share with their friends—or one that they check out of the library again and again. So if you go to the library this month you probably won’t find a lion—except sometimes as a statue. But you will find a lot of books like Library Lion that bring you into another world and make you want to stay there for a while. And who knows? I’m headed for the library myself today—maybe, just maybe, that wonderful lion will be there. Originally posted April 15, 2011. Updated for . I fell in love with this book my first semester of library school when I found it at an elementary book fair. I made my group use it for a presentation to the rest of our introduction class. I also read it to first grade students I worked with. Since then I’ve read a number of library related picture books, but this one remains my favorite. Funny, I was about to write, “I fell in this love with this book the first time I read it….” until I re-read the above comment! It’s such a lovable book — no wonder we all fell in love with it! It also has the wonderful quality of reminding us that everyone has a special talent or gift to share no matter how improbable. In honor of Library Week, we created two booklists for Reading Rockets & Colorin Colorado with other favorite books about the library. The lists feature a number of books that have been translated into Spanish, as well as books about beloved libraries (and librarians) from around the world! I read this one every year to second graders. They love it and I love it too! Anita, the page you posted of the lion licking envelopes for Miss Merriweather basically sums up why I love this book so much. Michelle Knudsen’s text and Kevin Hawkes’ hilarious text/picture interplay make this one of the funnest and funniest picture books I’ve ever read. I read this after the initial review, so I missed commenting. I love this story! Both the story and the art, make me happy. This is a book a grown kid has gotta own. The only problem I know with this site, is I keep finding books I have to own..
Gordon: This is definitely a “want to own book.” I’m glad you love it. I love this book! I included it in a “Lion and Lamb” story time I did at the beginning of March and even though it was a little long, the kids sat through the whole thing. They were as interested in what would happen as I was. 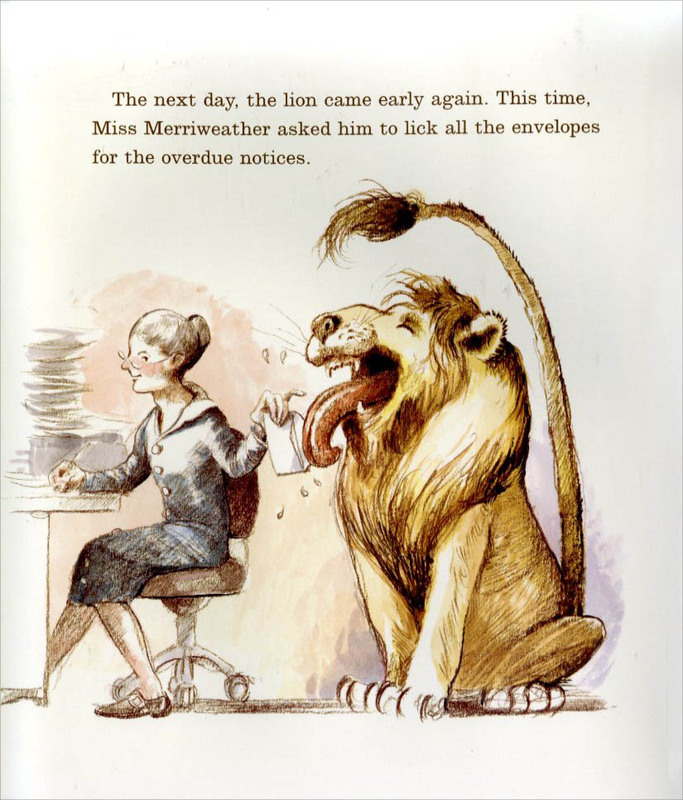 I love the way the lion is accepted in the library and Miss Merriweather just puts him to work rather than being concerned about his presence. I also absolutely love this book! The spread with the lion stuck out in the rain toward the end gets me every time. I love this book! I read it with my first graders and we go on a “Lion Hunt” in the Library. They love the chance to “run in the library”.